Zero waste plastic free travel size toiletries kit to fill with your natural skin, hair or DIY products to take travelling, all in an organic cotton laundry bag. Containers for liquid are below the 100ml maximum air travel restrictions. 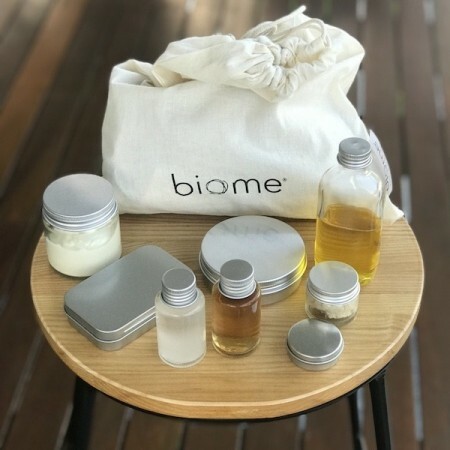 Glass and metal alternatives to plastic travel containers. 8 x containers all supplied empty. See below for inspo on what to pack! Toothbrush not included. 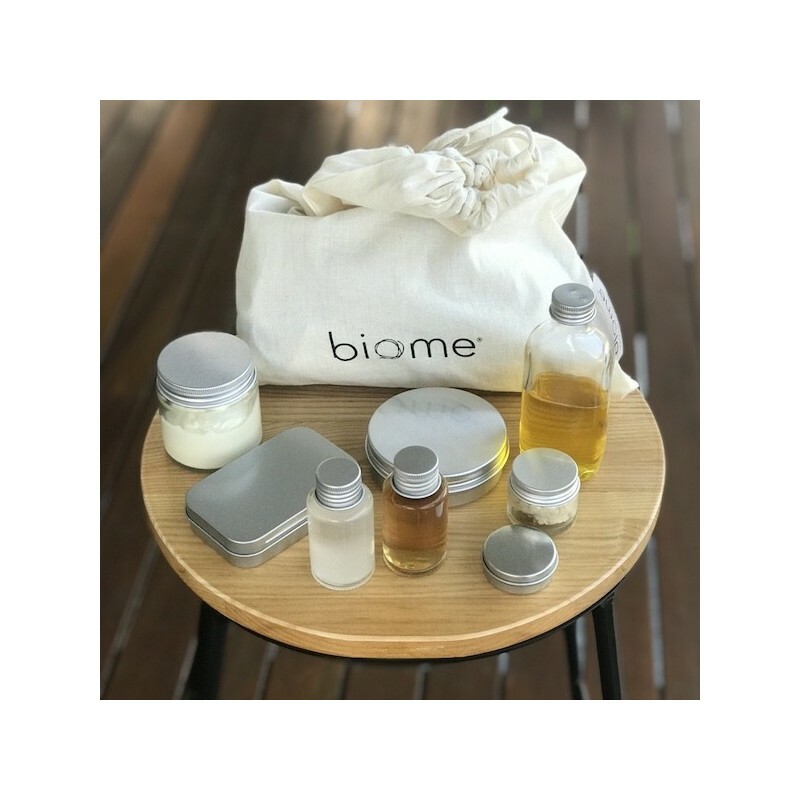 The gorgeous natural skin and hair care ingredients shown in the photo are not included in this zero waste travel toiletries set! 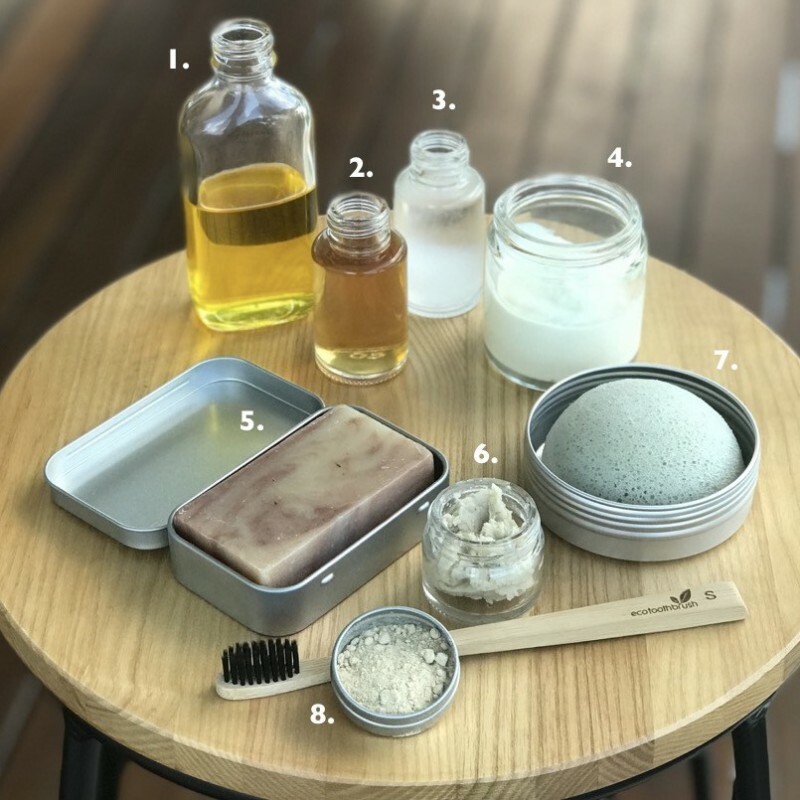 But you can read more below on how to put together a plastic free, zero waste travel kit with the simple, multi-use products pictured. Plus our organic cotton laundry multi-use bag for packing your underwear, holding your washing, buying bakery items, snacks, or carrying lunch while travelling. Bamboo Toothbrush is not included. Jojoba oil: face moisturser. Place a very small amount on finger tips and rub in morning and night. Apple cider vinegar: Conditioning rinse after using shampoo bar. Add a tablespoon to a mug of warm water and rinse through hair. Coconut oil: Makeup remover. Hair conditioner: rub a tiny amount onto finger tips, then scrunch through hair. Palm oil free body moisturiser. In this case, Olieve Hand & Body Cream. Shampoo and soap bar. Use for both shampoo and soap. We do recommend allowing your scalp to adjust to the shampoo bar for a few weeks before you go away, but it is not necessary. Follow with apple cider rinse. Ku Konjac Sponge: Face cleanser and exfoliant. Simply wet and rub in circular motion around face without needing any cleanser. DIY tooth powder: Make your own tooth cleaning powder or a ready made. Very useful. Though I have ended up using only some of the containers. Would like the aluminium container to be higher, ?deeper please! Great for travel, I just need to figure out how best to write down what is in each one!